Our Presenting Sponsors, through financial investment or the provision of goods and services, are committed to the growth and development of the Pacific Coast Shootout. 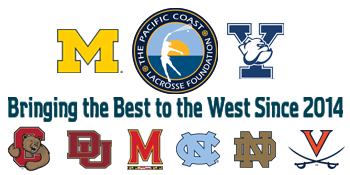 Their participation will enable the Shootout to firmly establish itself as a marquee event in college lacrosse. Presenting Sponsors receive VIP tickets & parking, pre-game field access, field level signage at LeBard Stadium, accesss to VIP events, integrated marketing opportunities, website and social media exposure, a table at participating team event(s) and behind the scenes access throughout the weekend.